Debilitating neuromuscular disorders and traumatic brain, spinal cord or peripheral injuries have a devastating effect on those who suffer from them. 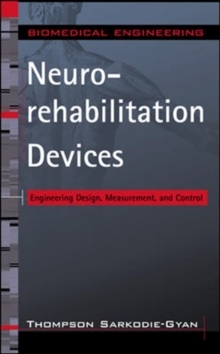 Written from an engineering perspective, and based on a course taught by the American Society of Mechanical Engineers, Neurorehabilitation Devices first helps the designer to better understand and formulate design, measurement and control systems for biomedical devices used in the treatment and recovery of people suffering from these disorders. Just some of the topics covered in this book are: methods to allow an amputee to control a powered artificial arm by means of electrical signals generated by contractions of muscles of the residual limb in combination with motor nerve activity from peripheral nerves, as well as the development of new technologies to use electrical stimulation to treat the hyperactive bladder, to electrically induce bowel movement and defecation, and to develop methods for selective stimulation of nerve fibres.